With the national broadcast premiere of Unrest on PBS/Independent Lens (USA) on January 8, now is the time to share this film with friends, colleagues, and family members who don’t know very much about ME or who want to know what they can do to help. 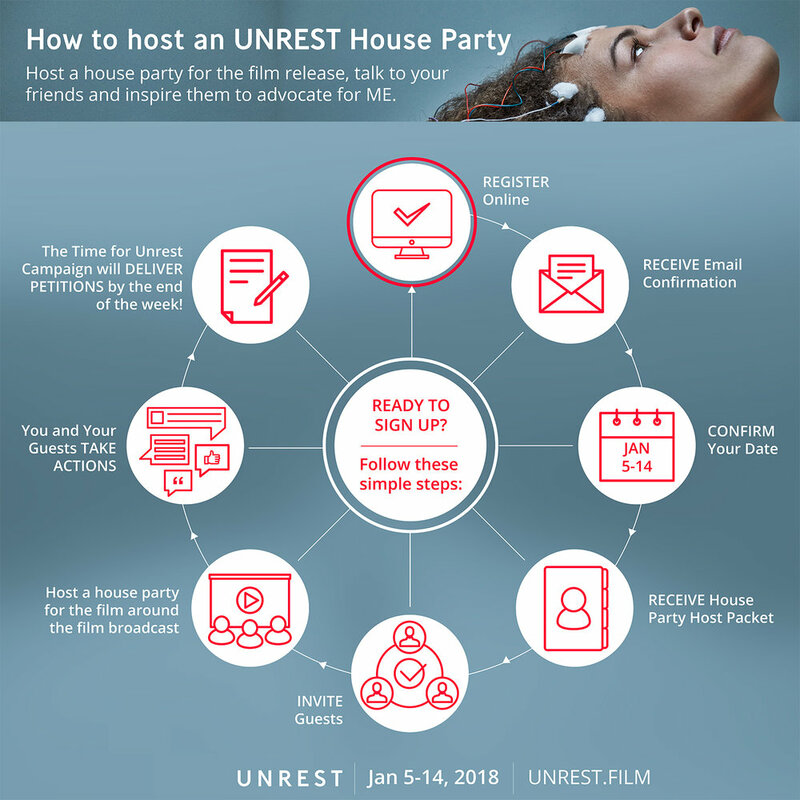 The Time for Unrest campaign will be hosting a worldwide house party program the full WEEK of the PBS broadcast (January 5, 2018 to January 14, 2018)! There will be many ways for you to watch throughout the week. We hope that you will host a house party, inviting your friends and family to better understand your experience with this disease. SMCI is the only non-profit organization solely dedicated to making ME/CFS understood, diagnosable and treatable. We believe that the best way to serve patients is to solve this debilitating disease by investing in promising research and fostering an environment for scientific collaboration. We work to accelerate the discovery of safe and effective treatments, strive for an aggressive expansion of funding for research that will lead to a cure and seek to engage the entire ME/CFS community in research. Through scientific research and advocacy, SMCI serves patients and researchers alike, serving as an information center for the entire ME/CFS community, and enabling SMCI to make an even stronger case for federal government ME/CFS spending, by generating verifiable and large data sets with reliable metrics. In September 2017, Unrest launched theatrically in cities across the US and UK, and Australia, along with a global impact campaign, Time For Unrest, which aims to increase awareness, education, research and funding around ME. The campaign consists of community screenings to engage doctors, students, scientists, policymakers, and leaders in biotech & pharma around the world. In the US, the film will air on PBS's Independent Lens in January 2018.